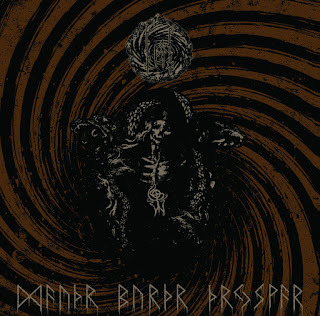 This right here is a mix of black and traditional and old doom metal. That's what makes Faustcoven unique. Both of these genres are inspired by the more old and classical idols and thrown into a very satisfying mix. How often do I hear something that reminds me of heavier Pentagram songs mixed with earliest black metal installments, such as by Darkthrone? Let's get to the picture that Hellfire and Funeral Bells paints. It is mysterious. The music's dark in both its message and atmosphere. It's very unusual in its compositions: The slow heavy riffs appear lazy, relaxing and crushing at the same time. I find the music strangely passive but stimulating and inspiring, which is an experience I don't hear very often within heavy metal. It's easy to float away somewhere else when listening to this album. Faustcoven is one of those bands that shine in creating an atmosphere and a world of its own, which you can get lost in. 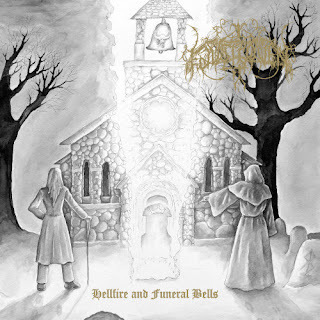 This immersive quality of Hellfire And Funeral Bells seems to take me away to a hot hellish place, an ancient graveyard or a dungeon with dark and devilish phenomena lurking all over the place. Once you open up to the music, they will guide you through their world lead by heavy riffs, dark haunting echoing vocals, and possibly my favorite part: the solos. I want to pay special attention to the first track of the album, also called "Hellfire And Funeral Bells" which has one of the most convincing atmospheric and chilling guitar solos I have ever heard. And this is exactly why I find the album unique: not often do I hear extreme black metal with guitar solos taken from what might as well be something heavy from 70's. This album is good at showing contrasts. Not only is there a mix of slow traditional doom and quick and piercing black metal, but the atmosphere told through the music itself stands out. It's like a freezing snowstorm meeting scorching infernal fires of Hell. Or if you ever played Magic The Gathering, it's like mixing black and white mana cards, where you get all sorts of twisted devilish beings creeping around. The music's strangely warm and cold at the same time. I consider myself lucky, because I actually discovered Faustcoven when Gunnar, the mastermind behind it, was operating on demo levels. Back then he used a drum machine, which added a strange element to the music, and I liked it a lot. I wonder how this album would have sounded with it. And that being said, the only negative part for me about this release is that I sometimes would get the feeling that the music is too correct in paying tribute to influences it follows. I can't really pinpoint directly any parts which lead to this, but seldomly I get the feeling that during certain moments there is a thought that a particular riff and its follow-up is too classical. Too Candlemass, or Black Sabbath, or Pentagram. Nothing wrong with these legends of course, but ocassionally I would wish that the compositions took the spirit of Faustcoven even further instead, since it otherwise does it so devilishy well. This year (2015) in dark ambient is exceptional, with three more months to go. Among the best releases I would be torn between Northaunt - Istid and Yen Pox - Between the Horizon and the Abyss, if I were so unlucky to be forced to pick just one. Dilemmas aside, let's get to it. 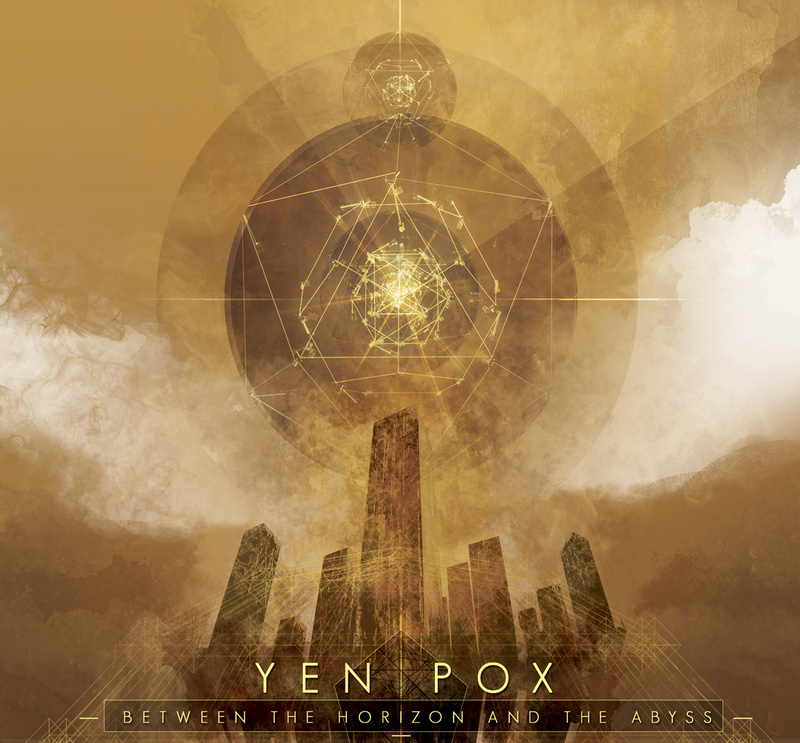 This new album by Yen Pox is really outstanding. I seldom look at track titles and the name of the release itself. This time my mind quickly made sense of it: among truly heavy, bass-filled, trembling, dimention-shaking sounds, I hear all sorts of weather related effects. Some tracks fill me with earth-mixing-with-sky atmosphere (which I guess does relate to the spheres between the horizon and the abyss). Certain other parts give an experience of standing in the middle of a tornado: it's dead quiet in a small circle around you, while the powerful wind whirls around you, chaoticly rotating all sorts of materials and tiny details in an encircled loop. This, I think, perfectly depicts the soundscapes throughout the album: they are complex, highly and richly detailed. It is amazing, actually, that this huge mix of sounds was made into such a meaningful musical experience. The artists here are true masterminds. I truly enjoyed listening to this album through headphones (over the ear - for max soundscape experience) and looking at the skies. Heavy clouds, enormous skyscapes, winds - both at dawn and when the sun was setting, complimented each other. The last track stood out in particular. The roaring bass loop that eventually fills the soundscape, before it echoes away, and once again returns, sounds like some sort of enormous entity looming above you in the skies. It's filled with winds, lightning, rolling clouds. It appears as threatening, yet in a way that is filled with awe. This track (The Procession) can be heard as a truly deep description of the aforementioned air elemental entity. These descriptions are actually just a few of many other similar ones that one can hear during the whole album. It is so rich in detail, that I keep finding new elements in it. I think it is important to stress that despite such a complex soundscape detail, this album is not tiring to listen to. But it is not soothing and sleep-inducing either. Actually the overall musical experience is so advanced that it sometimes would induce a state of flow for me, if you are familiar with the term (a simultenous feeling of inspiration and mastery). This was my first experience with Yen Pox, and from what I can hear, the other albums aren't far from this. I look forward to dwell deep in their discography in the nearest future, and I certainly think that this artist/project/band or whatever you want to call it, is among the more special ones that you can hear across all music. Oh, and I absolutely love the art design of the cover! I know little of Gnosis Of The Witch besides its origin being Iceland. 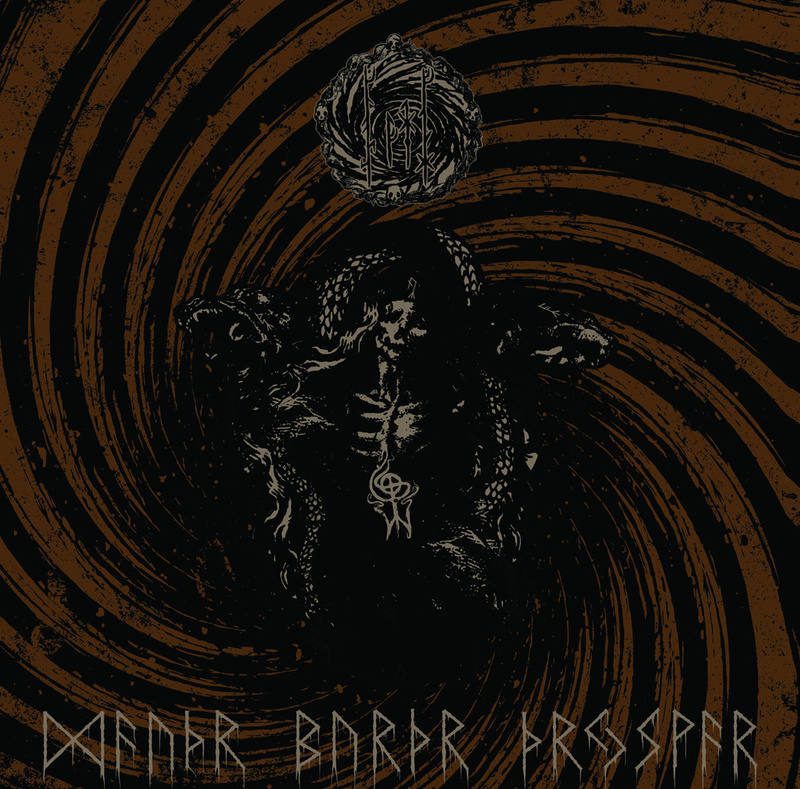 When browsing the discography from Iron Bonehead bandcamp page I was originally looking for something with more death metal in it, but this one particular release stood out, because it reminded very much of something old and special: Mayhem's Wolf's Lair Abyss. I don't know to what extent Gnosis Of The Witch are directly influenced by this album, but at times it sounds like it undeniably must be some sort of tribute. This old intense and raw release by Mayhem truly deserves its own appreciation post. Dauðr Burðr Þrysvar is the album's (or rather EP's, as it only has four tracks) title, which I prefer to leave untranslated to preserve the mystery and let the mind wander what it's really about by audio-exploring the music itself. I find this EP special because of two reasons. One being because I have always wanted to hear more of Wolf's Lair Abyss, and never quite found anything reminiscent of it. Dauðr Burðr Þrysvar is lacking in production by comparison, it's not as clear and hence less straight forward. I think I would enjoy it more if it had better sound and richer details, but it still appears memorable to me. The second reason to my appreciation is the musical part: The EP surfaces as deliberately complicated. The melodies may not be original and unheard of, but the overall composition gives me a sense that someone has put thought and skill into. The combination of sounds is fairly complex: straight forward with a touch of melody, and a mysterious distant atmosphere looming through-out the whole thing. This is where true musical skill emerges in my opinion, by being able to not only come up with interesting source material, but also finding ways to mix it all together into one musical stream. Dauðr Burðr Þrysvar appears ancient, strange, angry and shrieking, and sometimes dreamy.